I don’t know if you’ve noticed, but baby, it’s cold outside. Now that the holidays have passed us by and the rest of January looms lengthily in the distance—like a neverending hallway in a cheap hotel, carpeted with repeated patterns of discolored ivy leaves and fleur-de-lis—Father Frost appears to have finally taken an interest in his part of the year. 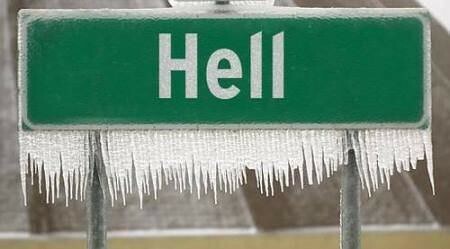 I repeat: it’s really f’ing cold. I’m still not quite sure how to deal with it. To get through this month, some people will advise you to abstain from alcohol. “It’s a trend!” they’ll shout, without the volume control a sober person normally possesses. “It’s good for you!” they yell, “Everyone is doing it! We’re having an Anything-But-Booze party this Friday, and you’re invited!” As they babble on, informing you of their drink-less plans for next weekend (Apples-to-Apples and Spin The Bottle), they’ll sound more annoying than a straight-edge teen, due to chronic use of the portmanteau “Drynuary”, an abomination. Of course, these people—however well-meaning—are wrong. In fact, this is the opposite of what you should do. And though Greenpoint has no shortage of bars, watering holes, inns, public houses, or whatever you call them, as of late, we’ve gotten one more: Ramona (113 Franklin St.), sister to the Lower East Side’s Elsa. The bar is run by husband and wife team Jay Schneider and Natalka Burian, the duo behind Brooklyn’s City of Daughters speciality cocktail goods. Ramona is a collaboration with Jay’s brother Scott. I dropped in with an old friend recently, after dining on cheap ‘zza next door at Lulu’s. Ramona has inherited the Production Lounge’s old digs, but you’d never know it from stepping inside. The main room is large, airy, and warmly-lit, beautifully designed by the bearded brothers from hOmE design firm, Evan and Oliver Haslegrave. (They’ve also hooked up a few other Greenpoint joints, including Tørst, Alameda, and Paulie Gee’s.) I spoke briefly with Evan, who told my friend and me that yes, they did pick every single fixture in the place. I guess the surprise must have shown on my face, because he went on—by that point, though, I wasn’t listening because I was too absorbed by the net aesthetic result of those choices. It’s pretty, y’all, with refined copper piping, sedately hip art on the walls, and low-watt incandescents. The hypnotic draw of the decor may also have had to do with the drink in my hand, something called a Boxer, Beetle (made with blackberry bourbon, Elsa’s Rose Hip Grenadine, lemon, allspice dram, and rosemary, according to TimeOut New York). 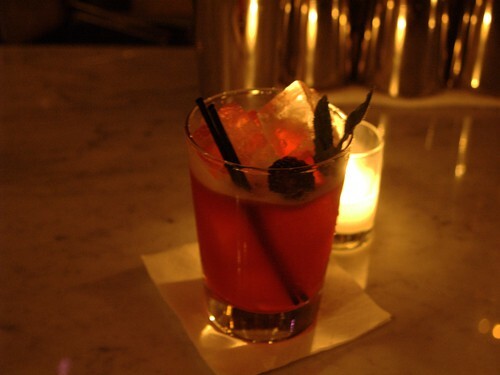 It was sweet and cold and refreshing—fruity, too, with a single blackberry riding atop the ice cubes—and, like the best whiskey drinks, had the peculiar effect of warming me up and cooling me down at the same time. I had two. I recommend three. One minor thing: no pricing was in evidence, so no word yet on how affordable this spot is. If its sister is anything to go by, however, we’ll have a great addition to the ‘hood (at Manhattan prices). But hey, at least you’ll leave warm. To hell with sober January. So you guys accept freebies when you review places? Good to know. We were invited to their Friends & Family opening night – so E it was FREE for everyone.